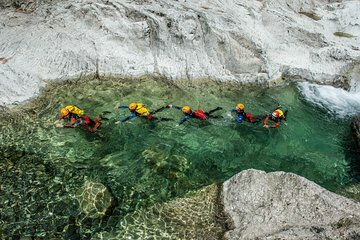 Enjoy adrenaline-pumping adventure in the Verghellu Canyon on this half-day canyoning tour in Corsica. Strap into your harness, pull on your helmet and enjoy a 20-minute walk through Corsica’s rugged terrain to your starting point. On arrival, follow your guide along the tricky rope courses and take in beautiful views over the Corsican countryside. Along the way, zoom along high ziplines, leap off high ledges into swirling waters, slide along natural chutes into deep plunge pools, abseil down sheer rock-faces and enjoy everything Corsica’s great outdoors has to offer.